The forefathers of the Kirgiz lived on the upper reaches of the Yenisey River. In the mid-sixth century A.D., the Kirgiz tribe was under the rule of the Turkic Khanate. After the Tang Dynasty (618-907) defeated the Eastern Turkic Khanate, the Kirgiz came into contact with the dynasty and in the 7th century the Kirgiz land was officially included in China's territory. From the 7th to the 10th century, the Kirgiz had very frequent communications with the Han Chinese. Their musical instruments -- the drum, sheng (a reed pipe), bili (a bamboo instrument with a reed mouthpiece) and panling (a group of bells attached to a tambourine) -- showed that the Kirgiz had attained quite a high level of culture. According to ancient Yenisey inscriptions on stone tablets, after the Kirgiz developed a class society, there was a sharp polarization and class antagonism. Garments, food and housing showed marked differences in wealth and there were already words for "property," "occupant," "owner" and "slave." During the Liao and Song dynasties (916-1279), the Kirgiz were recorded as "Xiajias" or "Xiajiaz". The Liao government established an office in the Xiajias area. In the late 12th century when Genghis Khan rose, Xiajias was recorded in Han books of history as "Qirjis" or "Jilijis," still living in the Yenisey River valley. From the Yuan Dynasty (1206-1368) to the Ming Dynasty (1368-1644), the Jilijis, though still mainly living by nomadic animal husbandry, had emigrated from the upper Yenisey to the Tianshan Mountains and become one of the most populous Turkic-speaking tribal groups. After the 15th century, though there were still tribal distinctions, the Jilijis tribes in the Tianshan Mountains had become a unified entity. In the early Qing Dynasty (1644-1911), the Kirgiz, who had remained in the upper Yenisey River reaches, emigrated to the Tianshan Mountains to live together with their kinfolk. Many then moved to the Hindukush and Karakorum Mountains. 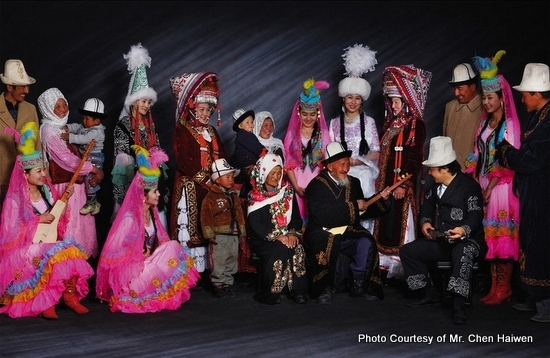 At this time, some Kirgiz left their homeland and emigrated to Northeast China. In 1758 and 1759, the Sayak and Sarbagex tribes of Eastern Blut and the Edegena tribe of Western Blut, and 13 other tribes -- a total of 200,000 -- entered the Issyk Kul pastoral area and asked to be subjected to the Qing.